Set on San Diego's beautiful Shelter Island, Vessel features a robust menu for breakfast, lunch, and dinner served in a unique, contemporary setting. 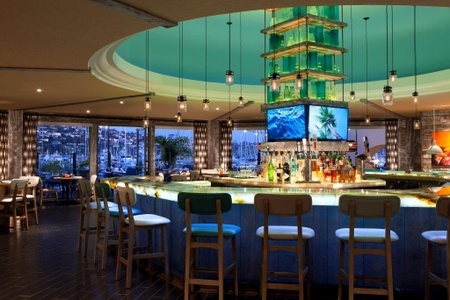 Diners flock for the spectacular panoramic marina view, in addition to the casual, informal atmosphere and great food. The menu offers a wide range of entrées inspired by Californian, American, and Polynesian cuisines. Fresh fish and seafood are their specialty; flying in buttery scallops from Maine and cooking locally caught Mahi-Mahi. Take in the mild sea breezes on the waterfront patio during breakfast or relax while the sun sets in the comfortable, inviting, and fun atmosphere. The perfect gift for any occasion. It's Quick & Easy! Do you have any gluten free items on your lunch and dinner menus? What a gem! The reservation desk had no difficulty accommodating our large party, and we were seated on time! The waiter was polite and attentive. The food was presented beautifully and tasted superb. The restaurant hostess allowed us to bring in a birthday cake, and the waiter served it for us. The bar was low key and comfortable. If you’re looking for a mellow, unpretentious restaurant then this is the place for you.